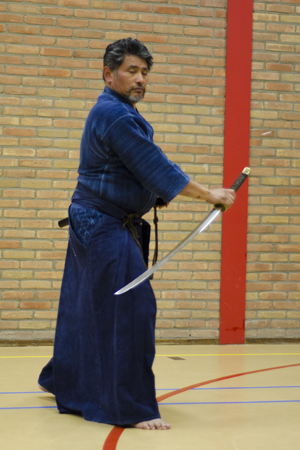 Just like Kendo, Iaido is a discipline based on the Japanese longsword, the katana. In Iaido the iaidoka strives for the ultimate perfection in the practice of the kata. A kata is a feigned fight against one of more opponents, of which every movement has been prescribed in detail. These feigned battles are executed solo. 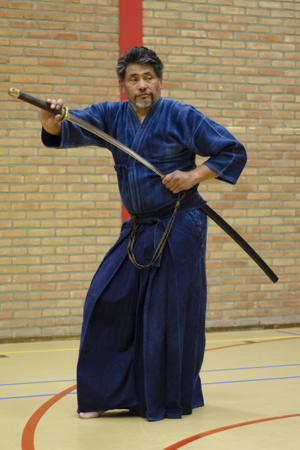 As training with a sharpened weapon is too dangerous the starting iaidoka will be training with an unsharpened practice sword (iaito). These practice swords are usually made of an aluminum alloy and approximate the feeling of a real Katana. Nukitsuke : To draw the sword and make the first cut in one fluent movement. Kiritsuke : Making one or more cuts. 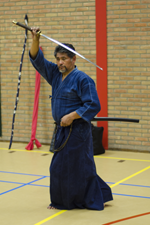 Chiburi : The removal of the blood and tissue of the blade. Noto : To return of the sword in the sheath. The iaidoka strives for unity of the sword, body and mind. It will be immediately noticed when one is out of balance. In the old ways of kenjutsu out of balance meant immediate death. The trained and skilled opponent will take advantage of every moment of weakness. A very important aspect is therefore zanshin: a state of concentration and vigilance to a threat in the surroundings. Furthermore self-control and (sword) etiquette are important in practicing iaido.